Not only is “pura vida” (pure life) a greeting and way of life in Costa Rica, it’s also a fruity tropical cocktail. My friend spotted it on the menu at RipJack restaurant on Playa Grande, and he couldn’t resist ordering a Pura Vida to complete his holiday experience. The Pura Vida cocktail is fruity and includes Cacique Guaro, which is a local spirit made from distilled sugar cane. 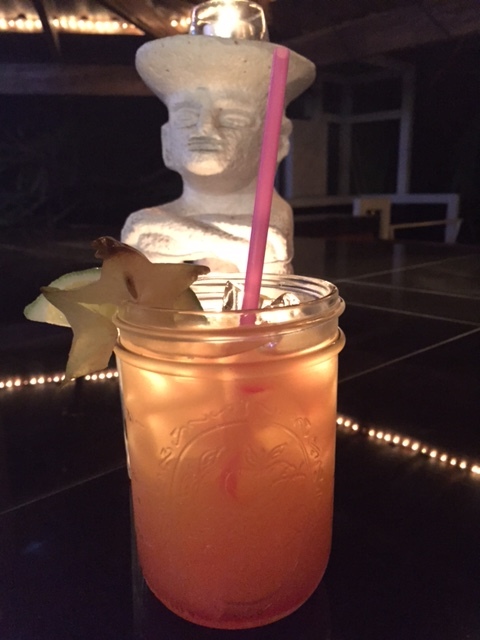 We all liked the drink’s presentation and agreed that the mason jar made it look less girly (it’s pink in hue and has a star fruit garnish). That certainly didn’t stop my friend from guzzling it down after everyone enjoyed a sip. Method: Into a mason jar add Cacique Guaro and grenadine. Fill glass with ice and add juices and Sprite. Stir, and garnish with star fruit and lime wedge. This entry was posted in Cocktails, Travel and tagged Cacique Guaro cocktails, Costa Rica cocktails, Pura Vida cocktail, tropical cocktails. Bookmark the permalink. YUM!! But where can I get this alcohol? Anywhere outside of Costa Rica? I’m not sure, Les. But our friends brought back a bottle so the next time you’re in Fernie!